Stronger than a locomotive... Faster than a speeding bullet... Able to leap tall buildings in a single bound... IT'S SUPERMAN! 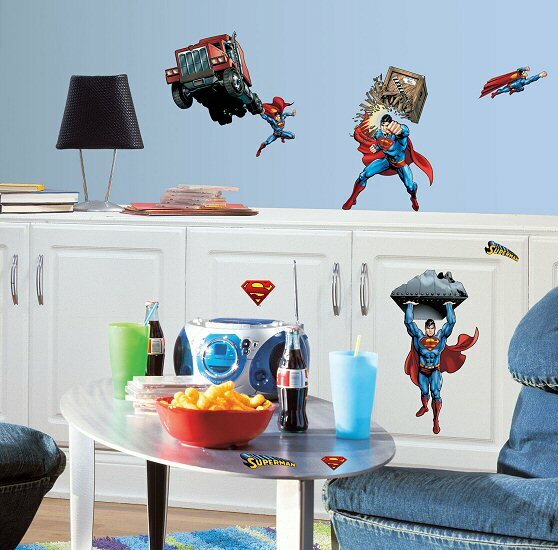 Featured in save-the-day action, these repositionable Superman Day of Doom wall decals will inspire hours of imaginative super-hero fun. Sure to delight children of all ages, these RoomMates peel and stick Superman Day of Doom wall appliques are easy to apply, easy to reposition, and are wall decor that will create an exciting super-hero atmosphere for years to come. Our RoomMates Superman Day of Doom wall decals (also known as wall stickers or wall appliques) are repositionable, removable, re-usable, and washable... a parent's dream combination for kids' wall decorations. Whether you are transforming bedroom, playroom, or even classroom walls, our peel and stick Superman Day of Doom wall stickers offer decorating ease with no damage or residue to the surface when removed. Approx. 2.75" x 2.25" to 9.125" x 11.75"